Rhodan’s HD GPS Anchor+® utilizes a proprietary WAAS enabled high definition (HD) GPS receiver that is optimized for slow speeds and stationary positioning. The advanced receiver provides Rhodan’s HD GPS Anchor+® system with sub-meter accuracy which enables the system to respond instantly to nail the location. Unlike similar products which shut off when close to the anchor site, the HD GPS Anchor+® is constantly active, adjusting immediately to the smallest changes in position. This allows for substantially tighter position control under a much wider range of weather conditions. A further advantage of the Rhodan’s “always active” control is lower power consumption. By making corrections as soon as the boat begins to move there is less inertia to overcome and thus the motor consumes less power to hold position. The patented dual compass approach used in the Rhodan HD GPS Anchor+® allows for numerous advantages over competitive products. 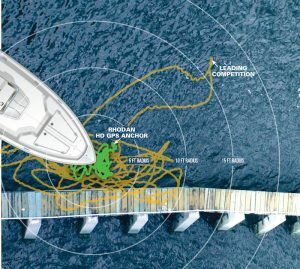 In addition to enabling boat heading related functions such as the Anchor Jog or Track features it also assists in tighter position control and prevention of cord wrap up. Perhaps the most important and least noticed feature is that it enables the system to soften its response should the thruster be pointed sideways to the boat in anchor mode. This virtually eliminates unexpected rapid side shifts which can unbalance the boat’s occupants.